Recent developments in nanoscience and nanotechnology have given rise to a new generation of functional organic nanomaterials with controlled morphology and well-defined properties, which enable a broad range of useful applications. This book explores some of the most important of these organic nanomaterials, describing how they are synthesized and characterized. Moreover, the book explains how researchers have incorporated organic nanomaterials into devices for real-world applications. Most of the chapters end with a summary highlighting the key points. References at the end of each chapter guide readers to the growing body of original research reports and reviews in the field. 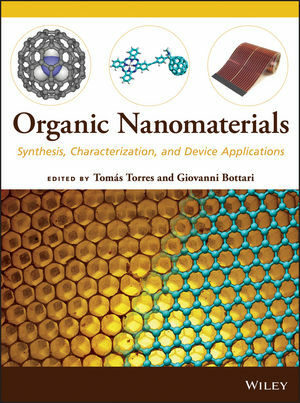 Reflecting the interdisciplinary nature of organic nanomaterials, this book is recommended for researchers in chemistry, physics, materials science, polymer science, and chemical and materials engineering. All readers will learn the principles of synthesizing and characterizing new organic nanomaterials in order to support a broad range of exciting new applications. Tomás Torres is Full Professor of Organic Chemistry at the Universidad Autónoma de Madrid and Associated Senior Scientist at IMDEA Nanoscience in Madrid. He has published 370 papers and reviews and holds forty patents. Giovanni Bottari is Associate Professor of Organic Chemistry at the Universidad Autónoma de Madrid and Associated Scientist at IMDEA Nanoscience in Madrid. He has published thirty-six papers and reviews and two book chapters.